Boasting national marine park status and extensive coral reefs, Cozumel—Mexico’s largest island, near the famed Riviera Maya—is a world-renowned destination for experienced scuba lovers as well as those looking to take a beginner diving tour. Here are some tips to help plan your next Cozumel diving excursion. Choose from a range of trips for certified divers to explore undersea tunnels, caverns, and reefs. Observe Cozumel’s mind-blowing collection of sea life, including giant sponges, psychedelic-colored tropical fish, rays, turtles, seahorses, and more. Experience more than 100 dive sites, including the sunken airplane at the Junkyard and the coral collections at the Palancar Reef. Marvel at the grouper fish and rainbow coral during a dive along the Santa Rosa Wall. Get your feet wet (pun intended) and learn the basic skills of scuba diving on a beginner dive held in shallow water. A beginner dive excursion is a great option for those just getting started with scuba. Pick from among a range of class options, from introductory scuba experiences all the way up to open-water certification trips. 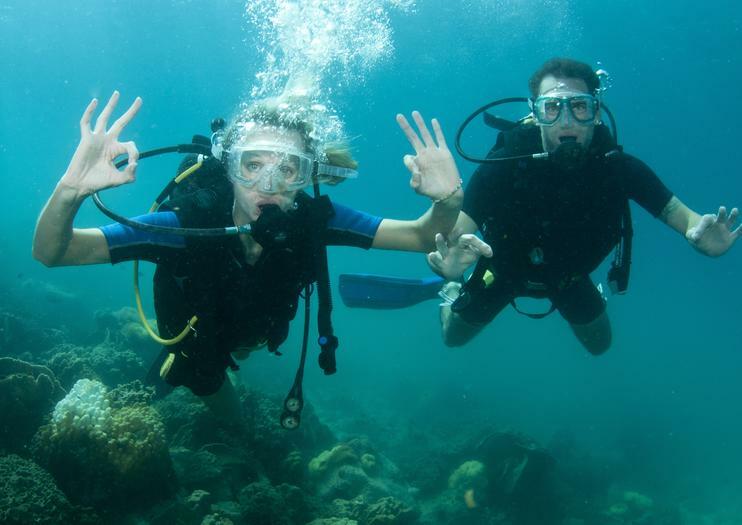 Though each excursion is unique, many beginner lessons comprise a short class to learn scuba basics, a practice session in protected waters, and then an open-water dive done with the aid of a certified instructor. Those divers who already have an existing certification can choose from among a wide range of diving trips on Cozumel. In addition to diving highlights like the Junkyard, the Palancar Reef, and the Santa Rosa Wall, divers can experience other top-notch outings like an exploration inside a cenote (natural limestone well) and the chance to discover diving sites near Playa del Carmen. Take an intro to scuba diving class on the island of Cozumel then tour the island in a VW Beetle convertible on this half-day combo tour. Start by learning the basics of scuba diving at a shallow water reef with a professional dive instructor. After your dive, travel in your convertible to a Mayan village, the Tequila Museum, and downtown Cozumel. You'll also stop at a restaurant for a Mexican lunch before drop-off at your hotel or cruise ship. Includes lunch, transportation, activities, and dive experience. Explore the underwater world of Cozumel's National Marine Park on a 3-hour scuba diving tour that includes two dives with your guide. It takes only 10 minutes by boat to reach famous reefs such as Palancar, Colombia, and others from the starting point in Cozumel. You'll also have time to relax on the boat in between dives. Includes guide, boat ride, and two tanks. Diving equipment is available to rent for the tour. There are few better places to learn to scuba dive than Cozumel, home to the Mesoamerican Barrier Reef. Get an introduction to diving during a 2-hour course with a PADI-certified instructor, a great way to discover whether you want to take your diving to the next level. Receive a 30-minute theory lesson and practice session before taking to the water with your guide. Choose from a morning or afternoon course, and upgrade to include two dives. Learn the basics of scuba diving and take two dives on a PADI Discover Scuba tour from Cozumel. The warm waters of Mexico make a great place to try the popular sport, and your guide teaches everything you need to know to do your first dives. The program includes an expert guide, use of equipment, a session in the swimming pool, and open water boat diving at a local reef.